Hi Guys, can you please let us know which company you got on board as the "skate park Design specialist"? Unfortunately the design looks a little outdated and I can see some very clear mistakes. Those pictures show nothing remove the stupid water mark and enlarge!! We’re not too sure what you mean by the watermark, as there wasn’t one on the plan. I think the design of this park is a big waste of concrete, there is so much more you could fit for $700000. I think for the area and the demographic of skateboarders, I feel the less ramps the better. Thanks for the comments about the ramps - we’ll follow up on this. have you thought about looking at the successful skate parks of recent and what the reception has been amongst the users? The question I think that needs to be asked is, how does Australia compare to other countries and how have they had success from what they have built. Great comment. We relied on the expertise of the design company, who had been involved in designing skate parks outside Randwick City and the experience of the local skaters who had experience of local Sydney skate parks and those elsewhere in Australia. Hi, Shane Azar from Volcom Clothing here. I run arguably Australia's best skate team, plus all our events. I dont wish to be completely negative here, as this design does show some positives in areas, but as a whole, the park is dated and not nearly up to the standards of skate parks on a global level. As a country we have put forward some of the best skaters in the world and as the sport grows, its parks like that which can either help propel more Australians into the global spotlight, or potentially waste more of the money the Government/Council have struggled to come up with in the first place. I do feel this is a continuing problem, and the fault lays not with the Council, but the designers... designers that may be to far from the beat of what Skateboarders are after these days, youthful skaters... It is understandable they also may be trying to make one skate park that caters to all forms of skater, but its now time the powers that be understand its not always achievable... Rather then cram all disciplines of skateboarding into one park with limited land and budget to utilise, focus on making something spectacular for the Youth Street Skaters of Sydney... Something that nobody has done in the past... i wont keep going on, but i will put forward my trust in the people who are actually respected to do such a job in Sydney - Cameron Sparks comes to mind and all the guys he is working with. Thanks for these comments. Council wants to deliver contemporary designs that best suit needs our local community. The design of this skate park was one that a group of local skates thought would be best, given the site limitations and the budget. The needs are diverse and the skate park is meant to service local needs and local skaters. Thanks for your feedback but specific comments would be more helpful. It’s not possible to put a skate park in Rodman Avenue. Following the Recreation Needs Study, the Chifley Reserve was identified as the best site for this youth facility. This design looks like something from a past generation of skateboarding. No one can argue that this in any way meets the standards or needs of today's skater. Look at what else is being produced around this country and you will see my point, Coffs Harbour, Fremantle to name a few. $700,000 on this is as bad an idea as playing in traffic in the dark. The skate park is meant to service local needs and local skaters. The skate park working group consisted of experienced local skaters who were trying to design a park that balanced accessibility within a limited space as well as stay within budget. When will this be started to be built? And why are bmxers trying to design it. They should be banned. Its been proven the last 20 years they tear up concrete repeatedly. The construction should be complete in the 2014-2015 financial year. The working group had a majority of skaters with some bmxers representation. Hi Randwick City Council, I have just had a look at the plans you have posted for the proposed Chifley skatepark, and as a local Maroubra skateboarder who has been skating for over 10 years, I am excited about the new skatepark but I also have a few suggestions concerning the design. The design seems to have been made largely by transition skaters, that is, those skateboarders mostly interested in skating bowls, with little thought being put into the street section. Don't get me wrong, I also like to skate transition, however, I feel that the design could have been a lot more accommodating to both street skaters and bowl skaters, without designating half the skatepark purely for a large bowl. One way to satisfy both types of skateboarders would be to include transitional features in the street section, such as quarter pipes with hips and bowl sections surrounding obstacles in the middle of the park. 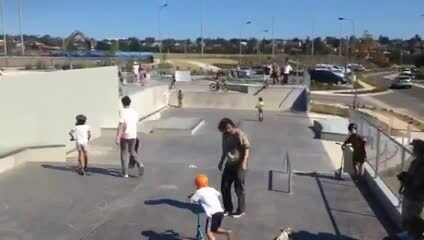 For an excellent example of how this has been done, check out the Belconnen skatepark in Canberra, which has a large variety of really interesting street and transition obstacles. Here are some pictures: http://www.skateboard.com.au/images/Belco3D.jpg http://www.skateboard.com.au/images/belcofinal6.jpg http://www.skateboard.com.au/images/belcofinal5.jpg It is a very popular skatepark due to the amazing design. I understand Chifley will not be so big, but the space still has potential for a few of the obstacles featured at the Belco park. Please consider a redesign. Thankyou for reading. Thanks for these suggestions. We will follow up and see if it is practical to include some of your ideas in the final design. This design is outrageously outdated! For $700,000 you could construct something that would at least be up to scratch with other projects currently being executed by councils around Australia. Please revisit this design !!!! Do not proceed with what's above..... The facility will not be used to it's full potential unless a drastic change is made!!!!! Do not waste such an amazing opportunity! Thanks for the comment. Do you have any practical suggested changes that would fit in with the budget and the site constraints, and is suitable for locals. Thanks for this suggestion. We will follow up and see if it is practical to include this in the final design. I have some concerns with the design what consultation has taken place with experienced skateboarders from sydney? As this plan appears to be outdated and not keeping with the latest needs of skateboarders. Looking at these plans I don't believe myself or most of the sydney skateboarders who skate a lot would utilize this park. Can I suggest you get in touch with the sydney skateboard association/experienced skateboarders from the current sydney scene before going ahead and building something that's outdated before it's even built you need to get this right or we'll be stick with another sydney skatepark not worth going too!! These designs are terrible. The design is very dated and does not look near the value of 700k. I would recommend consulting a design construct company like concrete skateparks, convic skateparks, oasis skateparks and precession skateparks. These companies can provide more relevant and cost effective skateparks as its a compete package. Have you guys committed to building these plans? Not too sure what changes you are suggesting. The costs for the skate park have been verified by a quantity surveyor as part of the brief requirements. Your recommendation of design construct contractors is noted. Council has committed the funds to build a skate park in Chifley Reserve. Thanks for these comments. Council will look at whether it is practical to incorporate any of your suggestions. The skate park working group consisted of experienced local skaters who were trying to design a park that balanced accessibility within a limited space as well as stay within budget. Let sydney skateboard association take care of the design. That design is fair from a skatepark design specialists work. I am longterm resident of Chifley residing in Macquarie Street which backs onto the reserve . We have had several problems with large groups of youths making their way down out street from the reserve drunk and vandalising our properties - Why do we not have a kids bike track instead to cater for the young families - if the skate park is to go ahead it should be fenced off wit a lockable gate at night to protect the ratepayers of the area from further vandalisation - surely the ratepayers should have a say ? Council had community consultations which were open to all residents in the development of the Recreation Needs Study. This study specifically identified a need for more facilities for youth particularly a skate park. Council also undertook extensive community consultation, once again open to all residents when developing the Plan of Management for Chifley Sports Reserve. The primary purpose of the Chifley Sports Reserve Plan of Management (PoM) is to provide the community, sporting groups and other user groups and Randwick City Council with a clear direction on the future use and management (short, medium and long term) of the Reserve. The PoM includes a youth/ skate park facility, and Council is bound to deliver the facilities proposed in the plan. The Chifley Sports Reserve includes a range of sports facilities for all ages, including a new children’s playground. It is anticipated that the skate park will be used by a range of young people and adults. We understand, as this is a new facility, nearby residents will be concerned about how it will be used. Generally Council has not experienced increased inappropriate activities associated with similar facilities. If issues do arise Council rangers and the police will be notified to deal with them. I'd like to express my concerns about having the skate park in Chifley. I live right near the development, and where the entry will be for this park. I have major concerns regarding the types of people this park will attract. I have seen the Maroubra skate park in full operation and this is not the type of park to have in a small, quiet suburb, which now houses a lot of young children, mine included. We have had numerous playgrounds vandalised in the area already, this type of park will only cause more issues, particularly on weekends and late at night. I encourage the development of the playground and bike tracks around the park, I think this is very important. Including a skate park only takes away from the family peacefulness the park will create. Thank you. The Chifley Sports Reserve includes a range of sports facilities for all ages. Council undertook extensive consultations which showed that there was a need for a skate park in the area. This was then incorporated in the Chifley Reserve Plan of Management, which was on public exhibition for community comment and subsequently adopted by Council. Thanks for the comment on the need for a street section. Council will look at whether it is practical to incorporate this. What contingencies have been put in place to ensure the security of the local community when the skate park is being accessed after hours? What public services are being established to cater for the transport of youth out of area i.e added bus routes from Bunnerong Road side? What time will the light on the park be switched off & who will police the park at night to ensure that teenagers are not using the grounds to enjoy alcohol, drugs, congregate & insight violence within the suburb of Chifley? While we look forward to the development of the park for the enjoyment of all residents & visitors, we must be conscious of the potential for mis-use & escalation of unwanted behaviours by the few who will spoil it for the rest, otherwise we are negligent in our roles / capacities as members of Council, residents, tax payers & parents. The skate park won’t be lit at night, discouraging night skating. Like any other public open space, if any resident or park user feels there is any anti-social activity taking place they will be able to contact the Maroubra Police. The police can respond appropriately to any reports of anti-social activity in the new park. There will be a range of sporting activities in the park, and the presence of others will act as a passive surveillance measure. Public transport bus routes will continue along Bunnerong Road with a bus stop adjacent to the main Chifley Sports Reserve entry. Any changes to bus routes and timetables are for Transport for New South Wales to decide. 1.will there be lights? 2.What Security will there be for youths not to be loitering at night and doing graffiti on the skate park? We understand that nearby residents are often concerned about how a new will be used. In general, Council has not experienced increased inappropriate activities associated with similar facilities. If there are problems, Council rangers and the police will be notified to deal with them. We are not installing lighting for night time use. Hi have some concerns about the skate park in the Chifley area. The night time is a worry. I have seen the young people hanging around drinking at the maroubra skate park and would not like to see this happen to Chifley. I hope you put plenty of trees around the Chifley side to deter them from coming through the streets of Chifley so they only enter and leave through Bunnerong Rd. Will there be police driving around? Will It be opened at night? Are there lights going in? If so what time will them come on and go off? Like any other public open space, if any resident or park user feels there is any anti-social activity taking place, they can contact the Maroubra Police and the police can respond appropriately to any such reports of anti-social activity. There will be a range of sporting activities in the park, and the presence of others will act as a passive surveillance measure. The development consent for the sporting fields restricts lighting on the sports fields to only 5 nights per week between the hours of 4pm and 9pm. Council has already planted a considerable number of trees in Chifley Reserve. My home is very close to this proposed skate park and I am obviously concerned about the types of people this skate park will bring to a once very quiet area. Other skate parks such as Maroubra and Bondi are some distance from residential homes and I am worried about this one being in such close proximity to my home. I also have young children that will now be exposed to a skate park since it is practically on our door step. Surely a much safer and better option for this space would be a much needed basketball court. This would also be enjoyed by the community without all the problems a skate park will bring to the area. The need for a skate park in the area was identified through the Recreation Needs Study and the Chifley Reserve Plan of Management, both of which we extensively advertised through a consultation and public exhibition process. Council has also had regular requests by residents from the community for the development of a second skate park in Randwick City. Council has not found that skate parks are any more prone to anti-social activity than any other public space. Like any other public open space, if any resident or park user feels there is any anti-social activity taking place they can contact the Maroubra Police and the police can respond appropriately to any reports of anti-social activity. When will the skatepark be open? I agree with the concerns that many of my neighbors have about the skate park: namely, lots of kids riding their skateboards through our local residential streets getting to and from the skate park at all hours of the day and night. I don't believe that it should be located in the Chifley Reserve. It would be better located in the current vacant large plot of land in Bunnerong Road, directly the Botany Road intersection. This is well away from housing; is closer to Matraville shopping centre and public transport; is far more open, allowing for better supervision; and allows the skateboarders access without using residential streets. Council notes your concern about skaters using local streets. The area you mention on the Bunnerong Road / Botany Road intersection is zoned as road reserve and cannot be used for recreational facilities. I am concerned with the building of the skate park in Chifley Reserve. This is the wrong location for a skate park. It will cause a lot of disturbance to local residents with kids riding their skateboards through local residential streets to get to the park, both day and night. As a far better alternative, please examine the area in Bunnerong Road directly opposite the Botany Road T-intersection. 1. Will there be lights? 2. Will there be Security? 3. Why has it cost so much? The orginial cost i read was $180,000 now it $700,000 4. We also need a basketball court maybe some of this money should be used. There will be lights over the sports fields, but not the skate park. Like any other public open space, if any resident or park user feels there is any anti-social activity taking place they can contact the Maroubra Police. The Council budget of $700,000 for the development of this skate facilityis the result of the nature of the construction, the amount of high class concrete required and the engineering of the foundations. This cost is the average cost for this size skate park. Council notes your comments on the need for a basketball court. Thanks for these comments. Let us know if you have any specific changes that will fit the site and the budget. When is the park likely to open? Thanks for these suggestions. We will follow up and see if it is practical to include your ideas. For the record, the skate park working group consisted of experienced local skaters who were trying to design a park that balanced accessibility within limited space as well as stay within budget. No, we are not planning to put in lighting for night skating. Night skating may impact unnecessarily on local residents. We are strongly opposed to the skate park being built at Chifley Park for the following reasons. After hours the skate park at Maroubra Beach is primarily a hangout for young people and it attracts anti social behaviour. How will you address/stop people hanging around on during the day, weekends and late nights, drinking alcohol and roaming the streets around the park and Chifley. Vandalism and break in of cars and houses are a concern. The only bus routes running past 11.30pm are on Anzac Parade and as we live at Macquarie St next to where the park is proposed , they will walk straight past our home to Anzac Parade. Concerned resident. In 2008 Council completed a Recreational Needs Study for the City. This study specifically identified a need for more facilities for youth, particularly a skate park. As required by State legislation, Council, after extensive community consultation, developed a Plan of Management for Chifley Sports Reserve. The PoM includes a youth/ skate park facility, and Council is bound to deliver the facilities outlined in the Plan of Management. We understand that nearby residents are often concerned about how a new will be used. In general, Council has not experienced increased inappropriate activities associated with similar facilities. If there are problems Council rangers and the police will be notified to deal with them. There are no plans for night lighting so night use is not planned. Is there going to be any flatbars, and flat ledges? space is really important. There are no flat bars or flat ledges in the current plans. Thanks for the comment - we will look into the possibility. Hi, I'm a local skateboarder and this park looks excellent aside from the lack of stairsets. I think it is an important feature in any skatepark, especially in sydney because of the large number of street skateboarders. I think you should push back the wall at the back of the skatepark near the smaller rails and put a five stair in it's place. This would allow for a better flowing skatepark with stairset-rail lines that would make the skatepark a lot more efficient for the amount of space it takes up. I hope you take my proposal into consideration. Thanks for the positive comment and for the suggestion about the need for stair sets. We will follow up and see if it is practical to include your suggestion. When is it going to be ready? I can't wait for it. We plan to build the skate park this financial year (2014-15). As a resident of Hastings Avenue, Chifley I am concerned about the noise/graffiti/type of people that this skate park is going to bring to the quiet suburb of Chifley as you will see from my email address I have voiced my opinion in regard to this before. You will also see below this was put in my letter of 14 April 2010 in regard to this issue. We have had a letter drop to all residents of Chifley in regard to this issue. I could think of better ways of spending $700,000.00 in the community. Yes, the actual reserve with fields is really looking wonderful - I really think this is going to ruin the park with this skate-park here. 1. Skate Park Facility - is there really a need for a skate park facility when there is a skate park facility within a 5 km radius at Maroubra Beach. Is it because it was opposed at La Perouse and Matraville that the Council has decided we will put it in the quiet suburb of Chifley instead. I have lived in the area for the last 34 years and have never seen any children on skateboards around the area. Chifley is a quiet suburb with working class families, my concerns are that it will encourage antisocial behaviour amongst children in the area and bringing teenagers from other areas into the community. As to the noise factor, either day or night since the expansion of the new Port you hear everything that is going on at the Port as the noise travels through such an open area right across from Botany Bay. If this goes ahead there should be a curfew and it be locked up as well as the amenities, so as it will not be used for tagging by graffiti artists and teenage underage drinking. As we said in response to similar previous questions, Council completed a Recreational Needs Study for the City in 2008, which included community consultation. This study specifically identified a need for more facilities for youth, particularly a skate park. As a Chifley residence, we totally disagree with this plan. We are worry about the type of crowd this would bring into our neighbourhood on weekends and late nights; alcohol drinking, streets roaming, which will lead to vandalism and break ins of cars and houses. The only bus routes running past 11:30pm are on Anzac Pde, which encourages them to walk through Chifley. As we said in response to similar comments, Council completed a Recreational Needs Study for the City in 2008, which included community consultation. This study specifically identified a need for more facilities for youth, particularly a skate park. I think the design looks great, the project is great, the money is well spent, kids, teenagers, young adults and even older adults will benefit from this skate park. The entire area around the skate park will be something we can all be proud off when its finished. It gives people of all ages things to do. The south ward is growing and this skate park and surrounds will be great for the area, there has been a lot of improvements to the area in recent years because people have shared their views personally to Randwick City Council or through the Matraville Precinct and Possibly also the La Perouse precinct. The area has and continues to go through changes. Im looking forward to seeing a great family recreational sporting environment for all to enjoy and be proud of. As Chair of the Matraville Precinct meetings I am proud to see us get the attention this great South East area deserves and proud to see us grow into the future. Lighting is something that will need to be sorted to ensure residents are not effected at night and also that the area is kept safe and clear of vandalism, hopefully regular Rangers, security and Police patrols will be conducted on regular basis and also possible consideration for a small area to be turned into a hut, station type area that a caretaker, police, security, Rangers can share as a visit station type area to hang out for a while and monitor when patrols of the area are carried out. Just a thought. Many people have said this will be good for the area as a whole. Also what is Council's risk and liability for accidents that may occur on this park. Can this become a possible litigious situation? Has this issue been addressed to your Councillors appropriately? Public Liability Insurance covers Council for any act or omission by Council that results in injury to third party or property. If someone hurts themselves in a park and Council has not been negligent we are not liable. Any situation can become litigious and Council has insurances in place. If someone chooses to sue Council, the claimant must prove negligence by Council. Skate parks are designed by professional consultants in conjunction with Council’s professional staff. A copy of the sign that is at Maroubra Skate Park has been uploaded to this site. This clearly sets out the conditions of use of this skate park and is in accordance to best practice. A similar or identical sign will be installed on completion of the Chifley Reserve skate park.